We once again want to thank each and every one of you for your support this legislative session. We were successful in our main focus of fighting to protect the tip credit, but that is not all we were up to for the past 60 days. NMRA was following more than just the minimum wage bill this year. We actually tracked over 100 bills on your behalf. Here are the bills that PASSED both the House and Senate. The current state mandated minimum wage is $7.50, 25 cents higher than the federal mandated minimum wage. Many cities and counties, however, already have mandated wages much higher than that. HB98 FINGERPRINTS TO RENEW A BUSINESS NOT REQUIRED: provided that where a licensing entity require submission of fingerprints as part of the initial license application, and a licensee has provided fingerprints and the license has been issued, the licensing entity shall not require a licensee to submit fingerprints again to renew the license, but a licensee shall submit to a background investigation if required. HB205 BABY CHANGING FACILITIES IN RESTROOMS: A place of public accommodation shall provide a baby changing facility in restrooms for men and in restrooms for women. This requirement applies only under the following circumstances: (1) when there is construction of a new restroom. 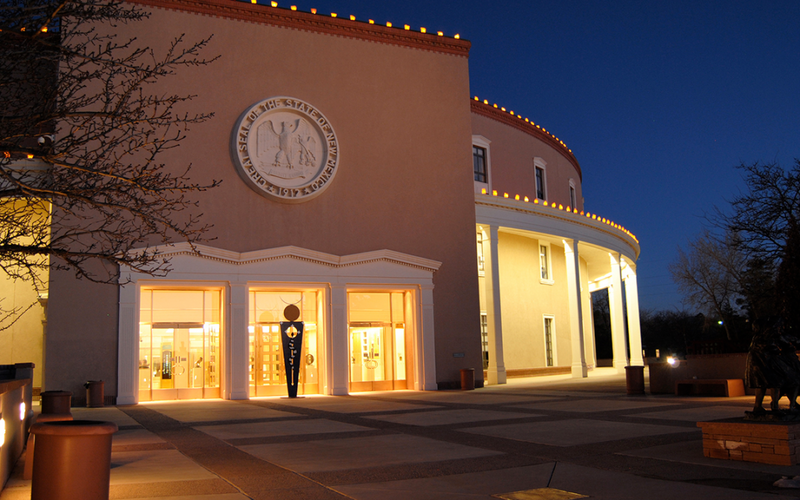 HB151 LIQUOR DELIVERIES BY LICENSED MINORS: Amending sections of the liquor control act to allow minors who are licensed under the New Mexico Commercial Driver’s License Act to deliver packaged alcoholic beverages. THIS BILL WAS VETOED BY THE GOVERNOR *SB494 BEER AND WINE DELIVERY LICENSES: Amending and enacting sections of the liquor control act to provide beer and wine delivery licenses for the delivery of beer, cider or wine together with meals or groceries to adult purchasers; providing for local option district authorization. Local option approval by holding an election on the question pursuant to the Procedures in Section 60-5A-1 NMSA 1978. Alternatively, the election may be initiated by a resolution adopted by the governing body of the local option district without the submission of a petition from registered qualified electors. As used in this section, “meals” means lunch or dinner entrees and does not include only an appetizer, snack or dessert. HB6 TAX CHANGES: 139 pages of tax changes nothing specific to restaurants but all of it pertains to citizens of NM. THIS BILL WAS POCKET VETOED BY THE GOVERNOR SB306 WINE& BEER SALES Private celebrations: providing for wine and beer sales at private celebrations; defining “private celebrations”; allowing winegrower and small brewer Sunday sales to begin at 11:00 a.m.
SB413 LIQUOR PERMIT TAX & DEFINITION CHANGES: Adding pears to the definition of “cider” in the liquor excise tax act and the liquor control act and raising the maximum alcohol content of cider; amending the definition of “microbrewer” in the liquor excise tax act; amending rates of the liquor excise tax; amending the definitions of “spirituous liquors” and “winegrower” in the liquor control act; providing for private celebration craft distiller’s, winegrower’s and small brewer’s permits; changing the hours of operation of a craft distiller, winegrower and small brewer; establishing criteria for renewal of a small brewer’s license. *HB256 ADD E-CIGARETTES TO CLEAN INDOOR AIR ACT: Amending the Dee Johnson Clean Indoor Air Act to include e-cigarettes; removing certain definitions; restricting smoking-permitted areas. SB 96 RELATING TO EMPLOYMENT OF EX-CONVICTS; (“Ban the Box”) Probiting private employers from inquiring about an applicant’s history of arrest or conviction on an initial employment application; providing a grievance process. SB227 ADDITIONAL UNLAWFUL DISCRIMINATION PRACTICES: Amending a section of the human rights act to include sexual orientation and gender identity among classes protected from unlawful discrimination by all employers. SB462 CREATE OUTDOOR RECREATION DIVISION: Creating the New Mexico outdoor recreation division in the economic development department and the outdoor recreation advisory committee; creating the special projects and outdoor recreation infrastructure fund; creating the outdoor equity grant program and fund; making an appropriation. HB85 UNION SECURITY AGREEMENTS: Allowing union membership to be required as a condition of employment; establishing that the state has exclusive jurisdiction to prohibit union security agreements. SB149 RENAME ALCOHOL & GAMING DIVISION: to the Alcoholic Beverage Control Division.